Oates’ longtime songwriting partner, Daryl Hall, was despondent upon hearing the news of his close friend’s passing. The manner in which the killing took place, however, did not shock him. According to Hall, the events that led to Oates’ death began back in 1981, when while in the midst of recording their new album at their Norwalk, CT studio, a television news report detailed the escape of a dangerous Grizzly bear from the Beardsley Zoo in nearby Bridgeport. 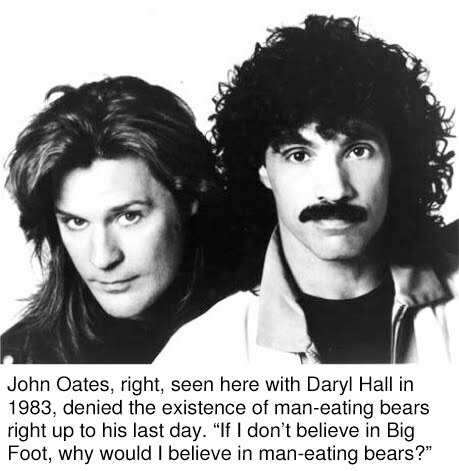 As the search for the elusive man-eating bear continued over the next decade, Hall continually warned Oates of the beast’s reported proximity to the Oates’ residence, only to have his words of warning mocked or outright ignored. According to Danbury police records, however, the songwriter’s death was not the first wild-animal-related death to hit the Oates family in the years that followed Hall’s initial warnings. Both of Oates’ wives and three of his five children were violently killed from 1991-1996, all having been similarly mauled by large bear-like animals while alone in the woods. Then, on the evening of June 14, 1998, Oates’ eight-year-old daughter, Audrey, went missing during a family camping trip just outside of Torrington, CT. After waiting three days for her to return to the campsite, Oates finally asked authorities to begin a search for the missing child. Despite police finding Audrey’s mangled corpse in a bear den a week after her disappearance was reported, Oates steadfastly refused to believe that the death was anything more than a freak accident. 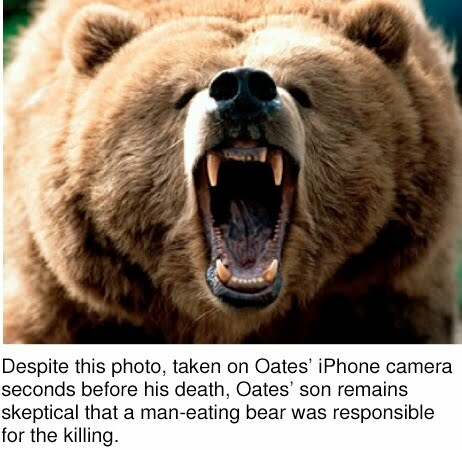 On Tuesday, Oates’ lone surviving child, Derrick, publicly attacked police and forensic reports detailing the circumstances behind his father’s death, comparing the department’s belief in man-eating bears to a child’s belief in Santa Claus or the Tooth Fairy. While authorities have publicly condemned Oates’ hiring of private eyes, they do agree that his plan does sound catchy.